Since the time human beings have become the supreme force on earth, men have dominated and carved a niche for themselves. But without women nothing was possible. But it has always been a man's dignity to accept a woman's contribution to the society. She has just been a silent spectator and an artist. 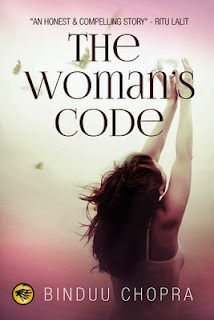 Author Binduu Chopra in her latest book "The Woman's Code" talks about woman and their lives. So has she pushed the readers towards a new thought process? Let's find out. She was not like most of the Indian women we know and read about! She was not someone who wanted to be confined to the kitchen. The wild teenager didn't want to let go her dreams that got buried when she was married at 18. Filled with love, compassion and a desire, she started to weave back the threads at 40. Will she fulfill her dreams? Will she find her freedom? Or will she find the dust on her furniture more important than the poems in her heart? In this intimate & heartfelt story, you will find a woman's fight to take possession of her strength & desire. Its a journey that describes the importance of emotional balance in relationships. Its a journey that describes a woman. Its a journey that describes The Woman's Code. First look at the title and the cover and the both of them speak volumes about the theme of the book. It's a beautiful cover image and the title just goes hand in hand with it. The blurb gives an idea about what to expect from this novella and it's all based on women. The blurb poses a lot of questions which will be answered in the story but excites the readers up to some extent. The story is of Sumi and her life right from the childhood and her parents and then her schooling and then her struggles to keep up with the pace of the life and adjust to new environment because of her father's frequent postings. From the time to make new friends till her college life the insecurities of life and fears inside her and then her strict life and traditional family to go with. The marriage vows and woes and her equation with Kartik and then later on evolving herself for the multiple roles she had in her hand right from being a mother of two children and being a caring wife and a perfect homemaker. Life doesn't gives her exactly what she wants but will things change in the end? How all of this will impact her as a woman? Will she be able to survive this woman's code? That's what the story is all about. The story is an insight about a woman's life right from the childhood till her old age and her responsibilities. Her struggles and adjustments and her spirit and zeal to deal with each and everything has been dealt with perfectly. The narration is simple and fluid and a lot of events can be easily connected to the everyday life of a woman. The downside of the book is it's less explanatory feature. It could have been done and expanded a lot more and dealt in depth with the woman's issues. Also the end looked quite rough around the edges and felt incomplete. The novella is overall a short yet a to the point narration of a woman's ordeal which goes for everyone in real life too. It's not in an expanded form but still holds it's own. It's a nice initiative on the part of the author to provide a fruitful insight of a woman's struggle all throughout her life.